A view of the Catholic Church taken in September 1944. The smoke blackening of the building can be seen, especially around the windows. With the passage of time much of this smoke damage has been washed off by weather action. Note the largely intact, but collapsed roof in the foreground which has come from an adjacent building (it is not a part of the church). Compare this view with that of June 1998. A point to consider is that, if the church steeple was used to store explosives, as claimed by some people, why is it still standing relatively undamaged? 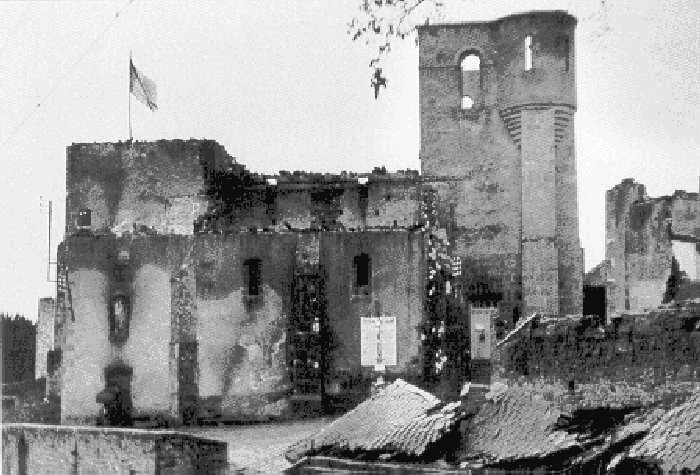 It is obvious that the roof of both steeple and church have gone in the fire, but according to one of the SS reports, "The flames (from adjacent houses) had sprung over to the church, which was burned out to the accompaniment of violent explosions" (Tulle and Oradour, a Franco-German tragedy by Otto Weidinger). Quite how flames could 'spring over', to a stone built church from a stone built house and set it alight has not been explained. Note: I have been unable to discover who holds the copyright to this picture.